A 3-in-1 AMT Trophy kit from the 1960s, the Studebaker Avanti has been reissued several times, but this is the first time it has returned to the original box design, albeit a box that’s slightly bigger than the first time round. The Avanti was first released in the AMT ‘Trophy’ series, kits with generally more parts than usual, in this case a component-count approaching 150, including extra parts that allow you to build a stock version, a generic Bonneville racer (below) or a mild custom. The custom version is distinguished mainly by having square headlamp surrounds, instead of the stock round design. 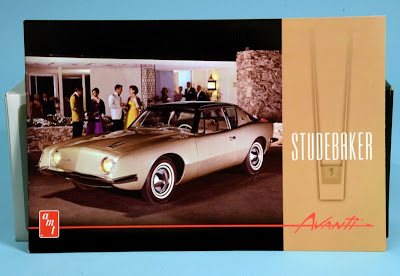 Intriguingly, Studebaker’s 1964 Avanti differed from the 1963 model mainly in having square headlamp surrounds, similar to those designed for the AMT kit by US car customiser, Gene Winfield. Rumour has it that the people at Studebaker saw Winfield’s work for AMT, were impressed by his square lights, and scaled the design up to use in the real thing! As is now becoming standard practice with AMT (and MPC) reissues from Round 2 LLC, the kit is issued virtually as it was originally. 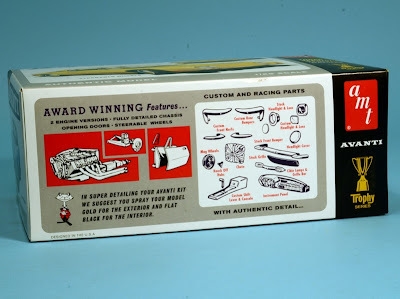 The only major difference here is that the box (above, listing optional parts) is larger than the original, perhaps to combat the urban myth that once you’d taken the parts out of an AMT box, you could never quite pack them all in again. I can confirm that once a stuffed-tight AMT kit of this era was unpacked, it was indeed very difficult to get the components back inside - and expect to fit the top back on as well! So this box is bigger, but the artwork is the same. You also get the same generic decal sheet for the Bonneville racer option as per the first issue, but there is a brand-new 16-page colour booklet (above left) to celebrate the Avanti’s 50th Anniversary, produced in conjunction with the Studebaker National Museum in South Bend, Indiana. I'll be talking about this museum in a separate article, due shortly. 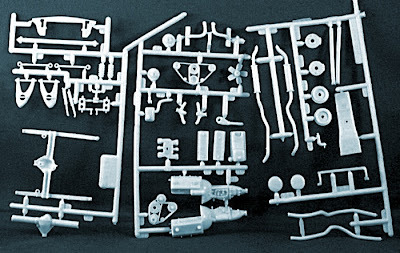 * Molded in white, clear, chrome. * All original parts restored. 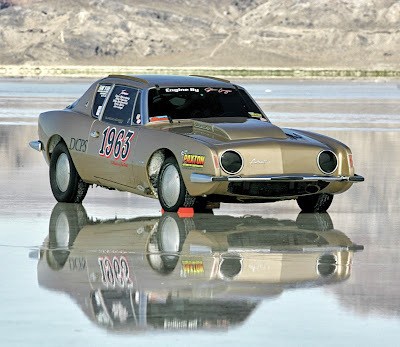 * Build Stock, Custom or Salt Flats racer. * Retooled optional Halibrand factory mag wheels. 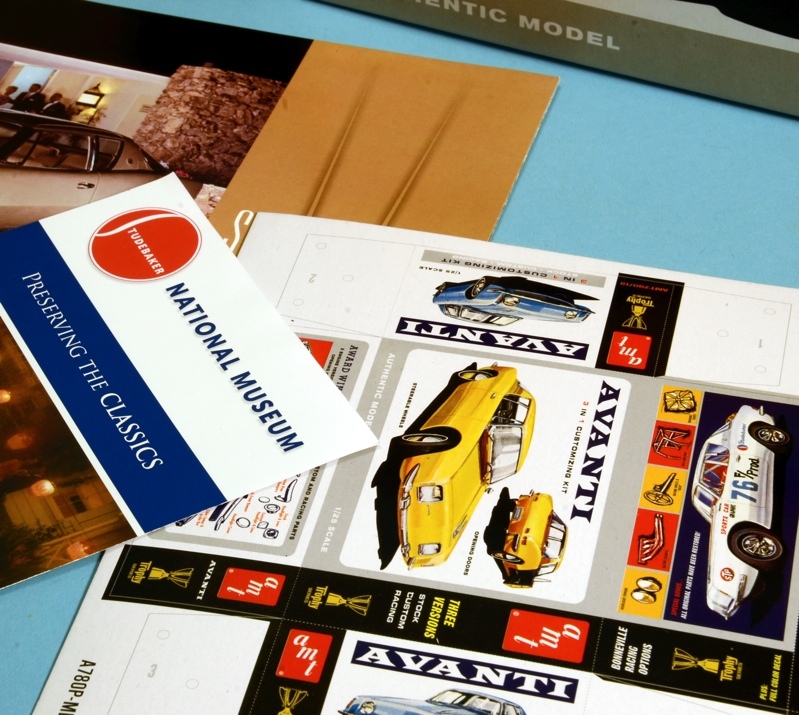 * Expanded original decal sheet. 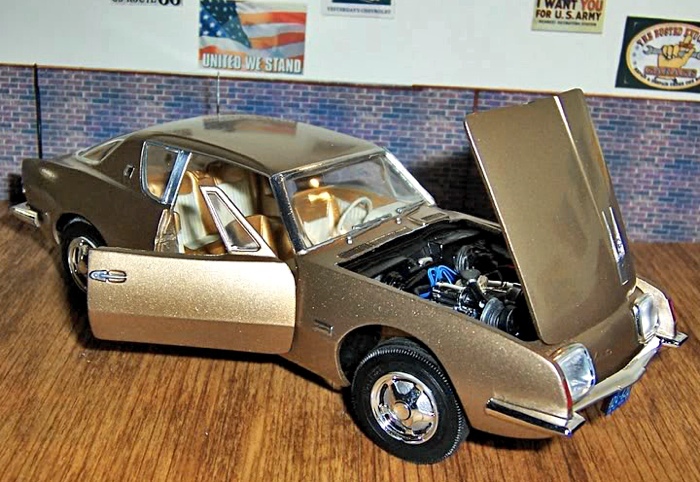 When assembled, the finished 1:25 scale AMT Studebaker Avanti measures some 190mm (7.5in) long. The kit offers two engine options, the R-2 or what looks like the hugely powerful dual-supercharged R-5. 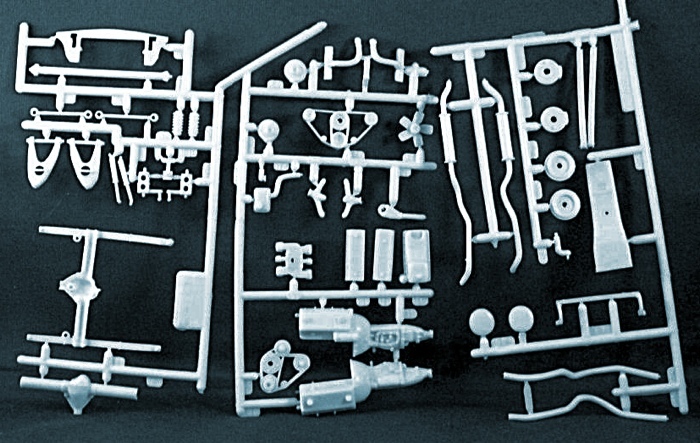 For a 1960s kit, the chassis is well produced, complete with dual exhausts, springs and other details. Two tyre options are included, whitewall and Stock Car Specials, and assorted wheels and hubcap options - very nice too. 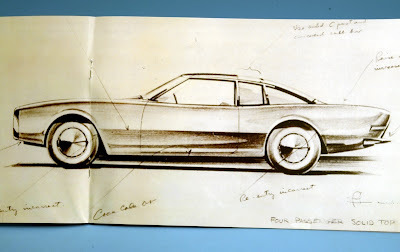 The interior can be built as stocker or racer, of which the performance option is probably most interesting, as it includes a roll cage, tachometer, race-issue shoulder harnesses, and custom shifter. 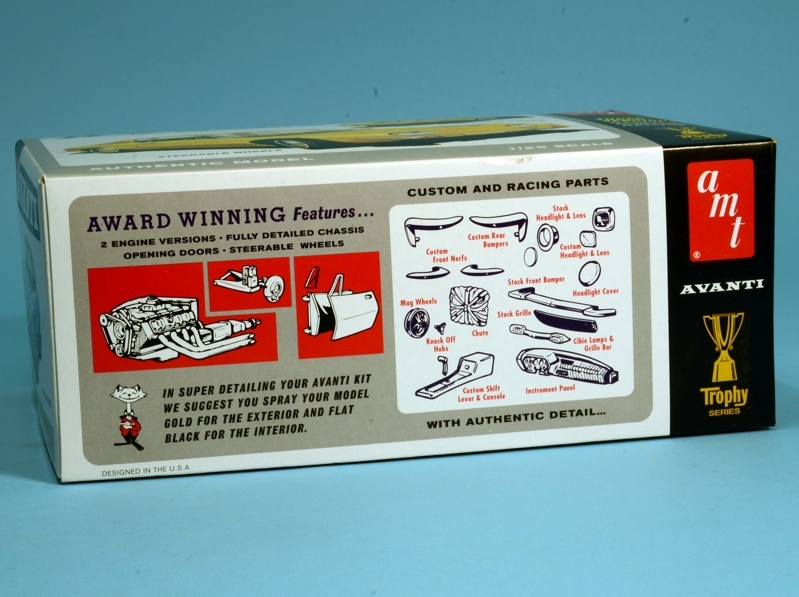 Assorted extras include a drag-race parachute, grille filter, bumpers, antenna and much more - very nice too. The Avanti concept resulted from sketches doodled by Studebaker president, Sherwood Egbert. The actual design to clay model stage was carried out by a team working under industrial designer Raymond Loewy, on a crash-priority schedule of just 40 days. The fibreglass body was mounted on a modified Studebaker Lark sedan, and the production car was fitted with front disc brakes, a first for a US production car. 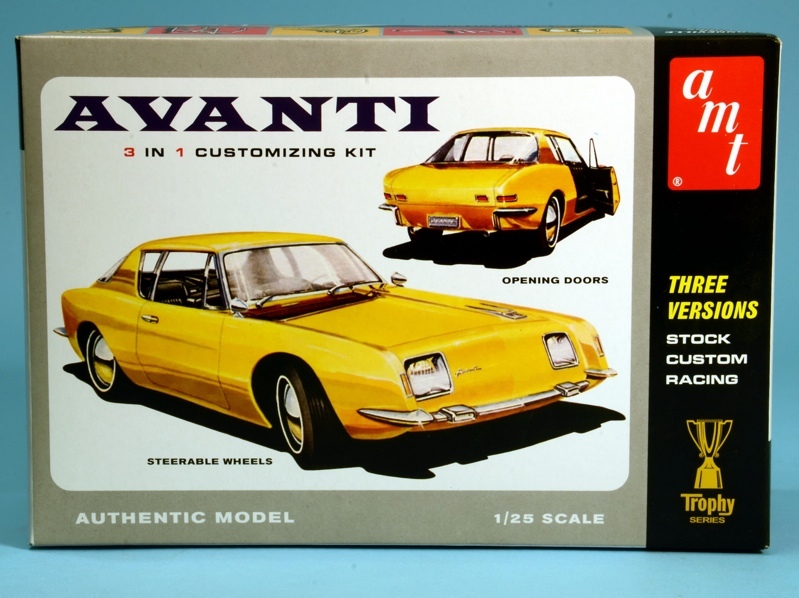 The Avanti Salt Flat racer (above) looks really cool, especially with those blacked-out eyes upfront, so would make a neat project, using the kit as a basis. The standard version in the brochure (below) looks pretty good too, so your choice might have to be to make one of each. 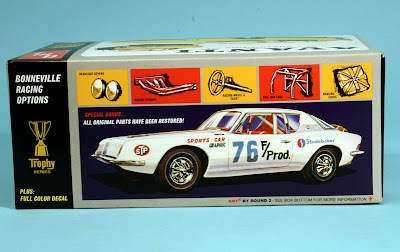 A desirable 1:25 scale kit of an unusually-styled automobile that differed in looks from the mainstream Detroit competition. Well worth it for 1960s car fans, but be warned, the kit is not really for beginners, as you’ll have to carry out some tweaks to get the best out of it. Review kit courtesy Round 2 LLC. Finished car by Brian Soderstrum.